Dropbox has today announced the launch of Dropbox Paper applications for iOS and Android mobile devices allowing you to use the word processor style service to create collaborative documents and share important information via the cloud-based Dropbox service. From today the Dropbox Paper mobile application is now available for Android users worldwide, while the iOS app will soon be launching for users in the EU, says Dropbox via the official Blog this week. 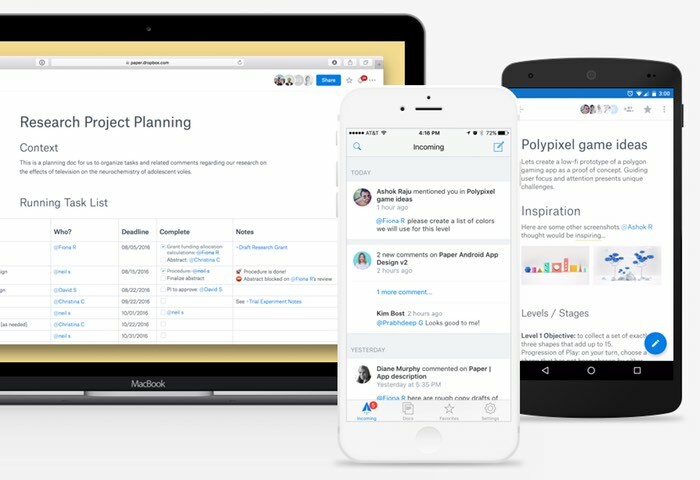 We built Dropbox Paper to help fast-moving teams create collaborative docs and share important information. It’s a big part of how we’re reimagining the way people work together. We originally launched Paper to a limited number of teams in private beta. And now we’re excited to open up the beta so anyone can sign up—without the waitlist. Plus, we have new Paper mobile apps for iOS and Android that you can use for on-the-go access. – Brainstorming ideas. Tackle big ideas, together in the same doc, at the same time—and use more than just words by embedding videos, images, and more. – Capturing meeting notes. Connect your Google Calendar, and Paper can create a custom notes doc for your next meeting and automatically share it with attendees. – Creating to-do’s. Start a checklist with just a few keystrokes, and assign tasks to others by simply adding “@” and a team member’s name.